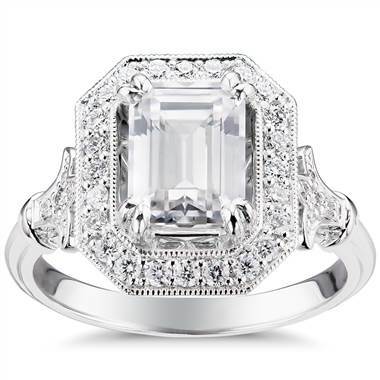 This emerald cut, halo engagement ring by Blue Nile is everything today’s bride can hope for. The halo setting, emerald diamond and art deco style is perfect for a romantic, yet trendy bride. We can almost predict the type of wedding dress designer she will reach for to design her dress (Monique Lhuillier) and she lives her best, most elegant life. It’s natural for her to fall head over heels for the emerald cut stone, however, to ensure that her diamond is highlighted in the best way, the person selecting the ring should ensure that it is of the best color and clarity within the budget. Emerald cut diamonds highlight inclusions more than any other cut, so purchasing a higher quality, yet smaller diamond is better than selecting a larger stone of lesser quality. The emerald cut stone is only a fraction of the reason we love this ring. We believe that all of the elements seamlessly blend together to create the perfect interpretation of an art deco engagement ring. Then add in the classic halo setting, which makes the stone appear even larger, and this ring is a definite classic for the ages. Vintage-inspired rings are extremely hot right now, and the art deco style within the vintage arena is the hottest. This style is typified by geometric shapes and the emergence of a bolder design; the very antithesis of the previous Edwardian and Victorian styles. Blue Nile’s vintage engagement ring is a testament to what happens when the past and present integrate in the best manner possible. This engagement ring is a showstopper which is sure to become a family heirloom in the years to come.